George Eliot followed the conventions of her time in titling her novels either after their hero or heroine or the setting where the action takes place. Later she began to give titles to each chapter, or to the individual "Books" which made up the complete novel, or to both. Since the titular hero was sometimes not the only or the main centre of interest in the novel, for example in Felix Holt or Daniel Deronda, the practice of giving titles to "Books" helped, in the usual circumstances of nineteenth century publishing, to point the reader's attention to the appropriate aspect of the developing fiction. The effect intended is: Now I'm going to deal with this particular part of my story. To remind a Review reader of these elementary facts, so common and so commonly taken for granted, would call for an apology were it not for a further and rather more interesting step which George Eliot takes. In Felix Holt, Middlemarch and Daniel Deronda she introduces each of her chapters with an epigraph. Thus the focusing mechanics employed are these: the novel has a title, the constituent books may have titles and the constituent chapters may have titles or epigraphs. Introducing a chapter with an epigraph in verse or prose was, of course, nothing new. I suspect George Eliot picked it up from her old favourite Sir Walter Scott. She pays tribute to him in a not particularly relevant epigraph to Chapter 57 of Middlemarch (hereafter referred to thus: M. 57) where the epigraph is an original sonnet to Scott. However, as I hope to show, George Eliot's epigraphs are more interesting than Scott's, if for no other reason than that half of them are her own compositions. The question remains: Why did she do it? What are they for? Does anybody remember them after the little more than perfunctory glance they attract? Without looking, could the present reader recall the epigraph to this note? Yet their very presence indicates a considerable amount of thought and research. Perhaps for no more than that they deserve a second look, for nothing that George Eliot published was casually or carelessly done. The commonly unnoticed epigraphs are as much the product of what has been called her "powerful, trained and formidably well-equipped mind" as are the novels themselves. It seems to me that part of the attraction they have for the reader interested in anything George Eliot wrote is the ample extent to which they justify the quoted adjectives. Others, perhaps, are the ways in which they suggest George Eliot's silent enjoyment in accepting the game-challenge of finding an apt epigraph and reflect the growing somberness and didacticism which had taken grip on her outlook by the time Daniel Deronda was created. 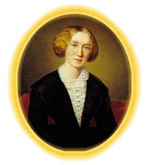 But before the noted somberness the epigraphs offer tokens of George Eliot's demonstrable attributes: her erudition, her idealistic sentiment, her sense of fun, her moralising bent and her love of aphorism. And, in any case, much of Daniel Deronda is pretty sombre. To an extent, then, George Eliot's choice of epigraphs, quoted or original and taken together, seem to me a revealing source of her wider beliefs, attitudes, hopes, sentiments and convictions. The reader will please note the qualifying phrase "to an extent". To what extent is a matter for private judgment, since the epigraph's primary focus is on the narrower content of a chapter.